I have been on a smoothie kick lately. One of my favorites is a chocolate strawberry smoothie (frozen strawberries, kefir, chocolate syrup, half and half or milk, and ice), BUT I was using a premixed powder. I wanted something a little better, so I made my own chocolate syrup, and love the way it turned out! I found a recipe on diynatural.com, but changed it a little according to what I had in my pantry. You probably already have these ingredients in your pantry, too! Pour water into a saucepan and stir in cocoa (until dissolved) over medium heat. Add sucanat and continue stirring. Once mixture is boiling reduce heat to medium-low, continue stirring, and set timer for 4-5 minutes (the longer you cook the thicker it gets.) Once your timer goes off remove from heat and stir in vanilla extract and salt and let cool. As it's cooling, mix in 1/4 tsp. of baking soda. This prevents sugars from crystallizing if the syrup is going to be stored in the fridge for more than a few weeks. It will foam a bit at first, but returns to normal during refrigeration. As the chocolate syrup cools it will thicken more, so if it is already thick enough then bottle it, seal it, and stick it in the fridge. You can store the syrup in a pint mason jar or any other jar you like. This recipe will yield approximately 10 ounces of syrup depending on how long you reduce the mixture over the heat. 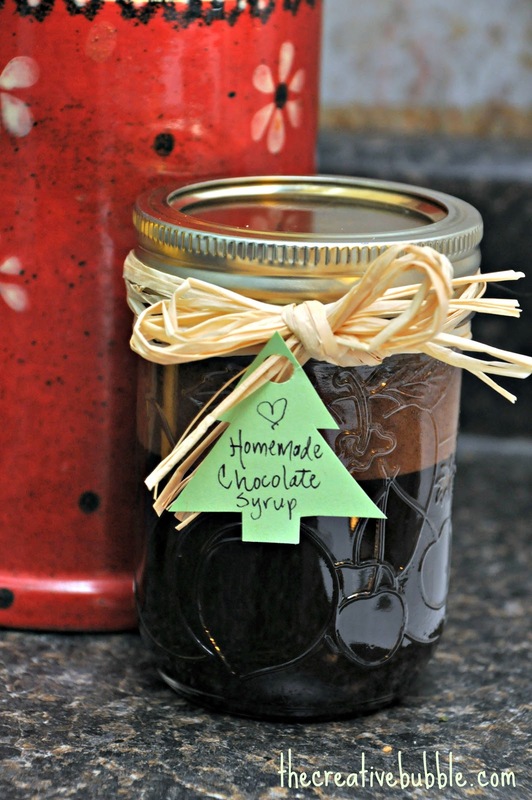 This syrup can last in the refrigerator for a long time, so it makes a great gift. I dressed up an old jelly jar with raffia and a simple gift tag. ice cream topping, smoothies, baking, chocolate milk, crepe/waffle/pancake topping, milkshakes, etc!